The Miles Design TimePod time and frequency analyzer has the ability to perform phase measurements using two reference oscillators rather than the more typical use of a single reference. By cross-correlation, the noise contribution of the two references can be greatly reduced and as a result the instrument can measure an unknown device with lower noise than either of the two references. Here are the results of a simple experiment to prove that this in fact works. First, I measured the noise of two crystal oscillators -- an Austron 1250A frequency standard, and the 10811 oscillator in an HP 5061B cesium standard operating in "crystal only" mode -- against a Wenzel 5 MHz Ultra-Low Noise oscillator ("ULN") using the single-reference technique. In the plots below, the Austron oscillator is shown in blue, and the HP in magenta. I then reconfigured the TimePod for cross-correlation by removing two jumpers, attaching each crystal oscillator to one of the SMA input jacks for channel 0 and channel 2, and changing the setup tab in the TimeLab software to reflect the new input assignment. You can see that the HP 10811 phase noise is quite a bit better than the Austron, which isn't particularly exciting news. What's neat is that the results of the cross-correlation measurement are significantly better than that of either reference oscillator by itself -- as much as 20 dB better at large offsets. 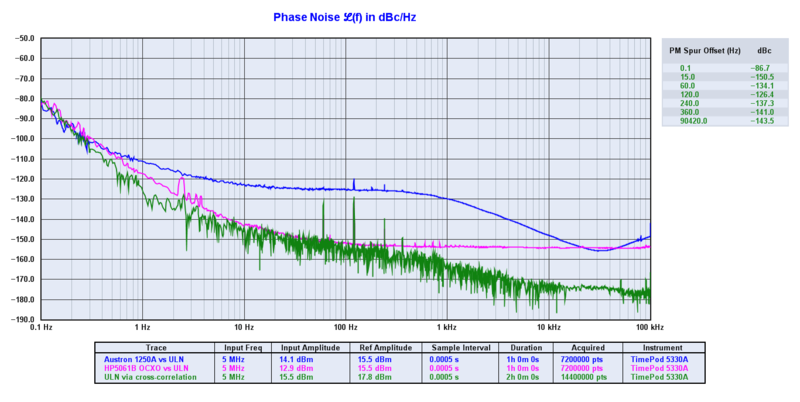 This measurement shows results close to the published specifications of the ULN: -120 dBc/Hz at 1 Hz offset, and a noise floor of -176 dBc/Hz. Correlation works by averaging, so the more data the greater the improvement. Much more data is generated for large offsets than small ones, so the correlation impact for a given collection time is greater on the right side of the plot. With a longer data run, the trace at shorter offsets would tend to smooth and lower (subject, of course, to the actual performance of the unit under test, and the noise floor of the TimePod). 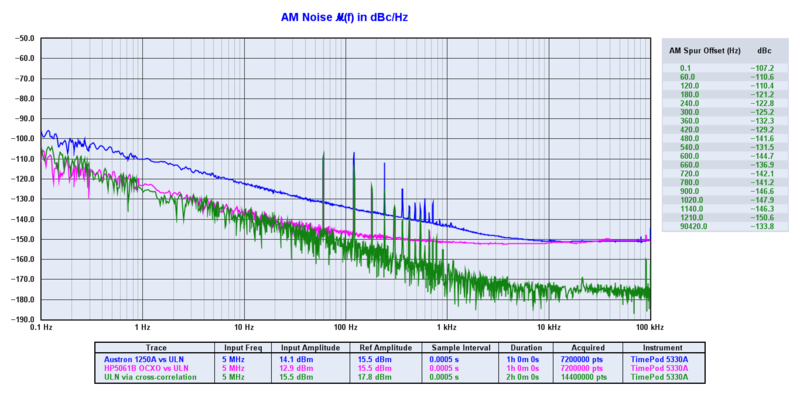 You can also see an interesting effect between around 20 and 50 kHz offset, where the Austron noise dips down to nearly match the HP. At that point, the cross-correlated plot becomes much smoother. Does this suggest that the two reference oscillators should be reasonably matched in performance? Copyright 1996 - 2019 by John Ackermann unless otherwise noted above. See Copyright and Other Legal Stuff for more information.